L = rainpl(range,freq,rainrate) returns the signal attenuation, L, due to rainfall. In this syntax, attenuation is a function of signal path length, range, signal frequency, freq, and rain rate, rainrate. The path elevation angle and polarization tilt angles are assumed to zero. The rainpl function applies the International Telecommunication Union (ITU) rainfall attenuation model to calculate path loss of signals propagating in a region of rainfall . The function applies when the signal path is contained entirely in a uniform rainfall environment. Rain rate does not vary along the signal path. The attenuation model applies only for frequencies at 1–1000 GHz. 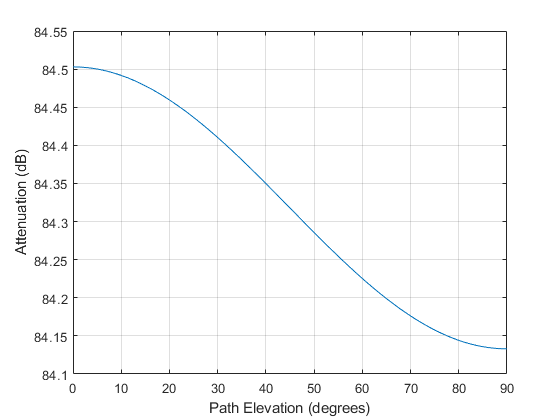 L = rainpl(range,freq,rainrate,elev) specifies the elevation angle, elev, of the propagation path. L = rainpl(range,freq,rainrate,elev,tau) specifies the polarization tilt angle, tau, of the signal. Compute the signal attenuation due to rainfall for a 20 GHz signal over a distance of 10 km in light and heavy rain. Propagate the signal in a light rainfall of 1 mm/hr. Propagate the signal in a heavy rainfall of 10 mm/hr. Plot the signal attenuation due to moderate rainfall for signals in the frequency range from 1 to 1000 GHz. The path distance is 10 km. Set the rain rate value for moderate rainfall to 3 mm/hr. Compute the signal attenuation due to heavy rain as a function of elevation angle. Elevation angles vary from 0 to 90 degrees. Assume a path distance of 100 km and a signal frequency of 100 GHz. Set the rain rate to 10 mm/hr. Set the elevation angles, frequency, range. Compute and plot the loss. Compute the signal attenuation due to heavy rainfall as a function of the polarization tilt angle. Assume a path distance of 100 km, a signal frequency of 100 GHz signal, and a path elevation angle of 0 degrees. Set the rainfall rate to 10 mm/hour. Plot the signal attenuation versus polarization tilt angle. Set the polarization tilt angle to vary from -90 to 90 degrees. Set the elevation angle, frequency, path distance, and rain rate. Compute and plot the attenuation. Signal path length, specified as a nonnegative real-valued scalar, or as a M-by-1 or 1-by-M vector. Units are in meters. Signal frequency, specified as a positive real-valued scalar, or as a nonnegative N-by-1 or 1-by-N vector. 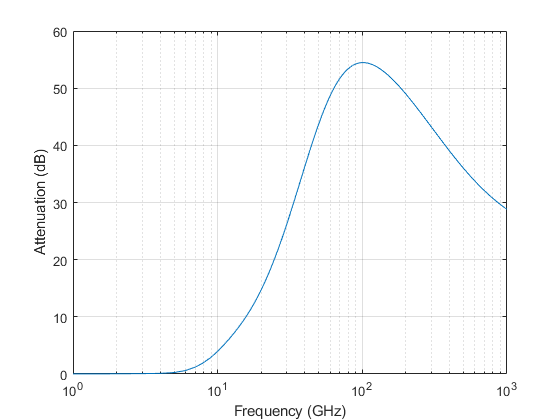 Frequencies must lie in the range 1–1000 GHz. Rain rate, specified as a nonnegative real-valued scalar. Units are in mm/hr. Signal path elevation angle, specified as a real-valued scalar, or as an M-by-1 or 1-by- M vector. Units are in degrees between –90° and 90°. If elev is a scalar, all propagation paths have the same elevation angle. If elev is a vector, its length must match the dimension of range and each element in elev corresponds to a propagation range in range. Tilt angle of the signal polarization ellipse, specified as a real-valued scalar, or as an M-by-1 or 1-by- M vector. Units are in degrees between –90° and 90°. If tau is a scalar, all signals have the same tilt angle. If tau is a vector, its length must match the dimension of range. In that case, each element in tau corresponds to a propagation path in range. The tilt angle is defined as the angle between the semimajor axis of the polarization ellipse and the x-axis. Because the ellipse is symmetrical, a tilt angle of 100° corresponds to the same polarization state as a tilt angle of -80°. 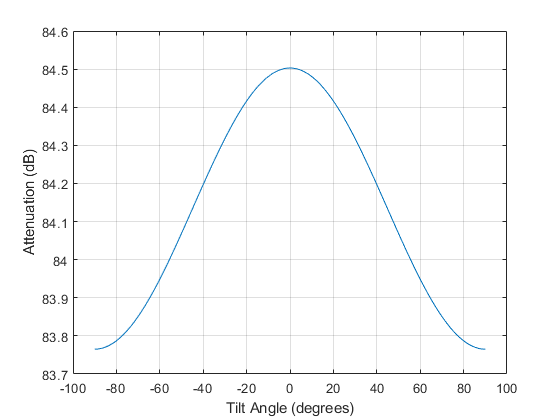 Thus, the tilt angle need only be specified between ±90°. Radiocommunication Sector of International Telecommunication Union. Recommendation ITU-R P.838-3: Specific attenuation model for rain for use in prediction methods. 2005.